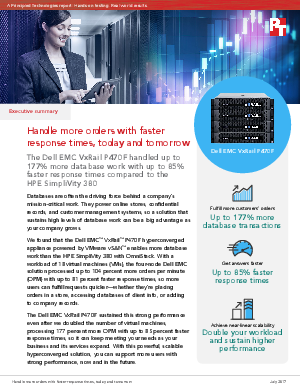 Handle more orders with faster response times, today and tomorrow. Databases are often the driving force behind a company’s mission-critical work. They power online stores, confidential records, and customer management systems, so a solution that sustains high levels of database work can be a big advantage as your company grows. Download this summary from Dell EMC and Intel® to learn more.